Join David Miles for a 15 day photography holiday packed with amazing opportunities to capture images of the diverse range of bird species & other wildlife that inhabit the locations that our Costa Rican wildlife photography tour encompasses. Our photography holiday offers a huge range of species including collared aracari, various types of frog, macaws, hummingbirds, keel-billed toucan, king vulture, resplendent quetzal plus many more. Special offer pricing available, other conditions may apply. Group size: 4 - 5 participants - last place available..
£4799 £3799 per participant - last place available. Join NaturesLens on an exciting photography holiday to capture images of the diverse bird species & other Costa Rican wildlife; this trip is ideally suited to amateur & semi-pro wildlife photographers. With a wide selection of locations included within the itinerary for this photography holiday, we will provide you with the best bird, mammal, amphibian, butterfly & invertebrate photography opportunities possible, capturing birds in flight, frogs within their habitats & various species interacting with one & other. 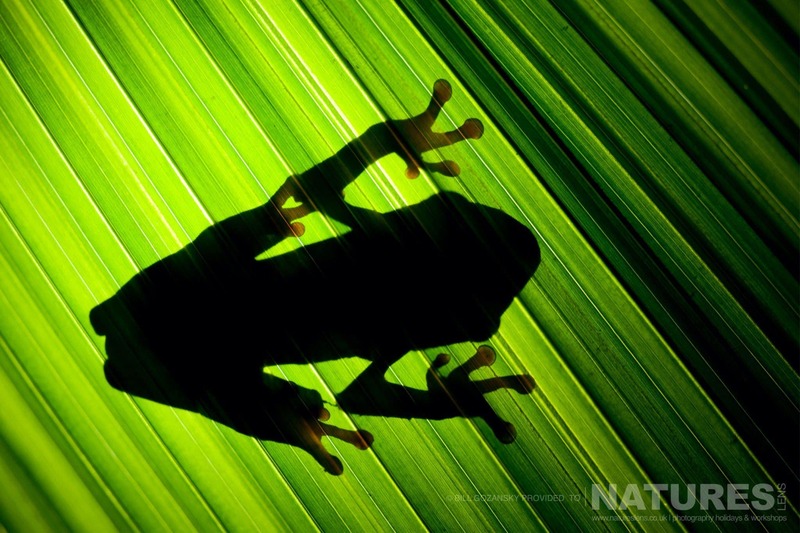 Costa Rica truly is a wildlife photographer’s dream come true! Literally meaning ‘rich coast’ in Spanish, Costa Rica has a wealth of natural diversity & wildlife, making it one of the most bio-diverse places on earth. Join NaturesLens to capture images of the massive number of bird species & other wildlife of Costa Rica, in Costa Rica, during the Wildlife of Costa Rica photography holiday. This photography holiday is of 15 night/16 day duration on a Half Board, Non-Shared basis & costs £4799 £3799 per participant. The range of photographable species which thrive in Costa Rica is a sight to behold. 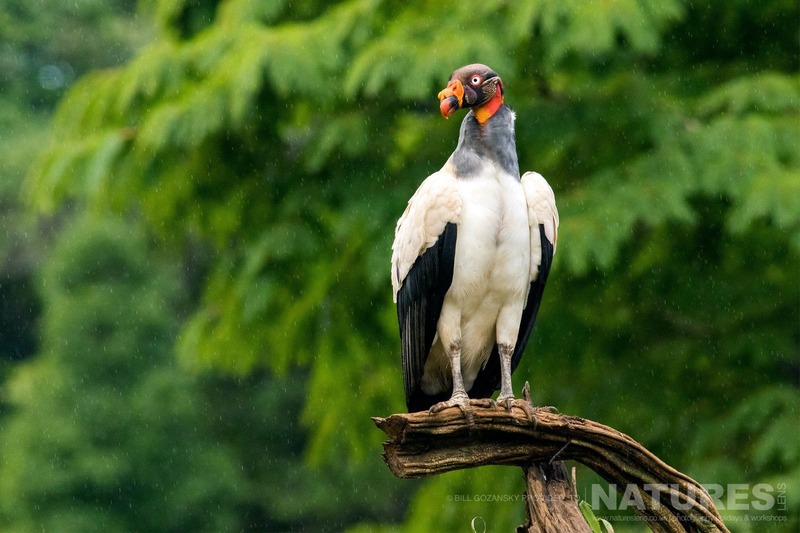 From the red-eyed tree frog to king vultures, the species we will encounter are diverse, but they all live side by side making up a large proportion of the delicate local ecosystem which exists in this region. The various birds, that we will encounter can provide some of the most exciting wildlife photography opportunities, as their quick, unpredictable behaviour keeps us on our toes & enables captivating movement & in-flight imagery to be captured. 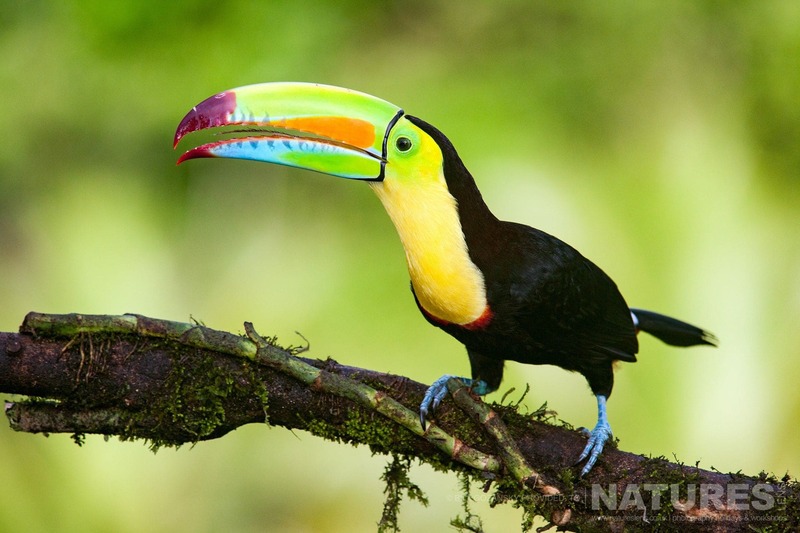 Our 15 night/16 day photography holiday to Costa Rica offers opportunities to photograph a huge range of native species, including keel-billed toucan, collared aracari, glass frog, green macaw, hummingbird, king vulture, red-eyed tree frog, resplendent quetzal & sloth, as well as many others. We offer a package of accommodation on a non-shared basis (with no single supplement payable) & food on a half board basis, to ensure that all you need to worry about is taking unique & mesmerising photographs. Sunrise & sunset are often considered the prime times of day for creative photography, so unlike other holidays & tours, during our Costa Rican wildlife photography tour, we will ensure that our photography sessions make the most of these times of the day. This provides unrivalled exposure to the variety of species & the environment which inhabits the various regions included within our offering. This trip will be packed with photography opportunities, we will cover many miles taking in Costa Rica’s famously diverse wildlife … mammals, reptiles, amphibians, insects & birds will ensure that this a trip that will make a huge impression. Our photography tour ventures first to the Boca Tapada region, home to up to 350 different species of birds, among them the Collared Aracari, the Keel-billed Toucan & the Great Green Macaw; to Sarapiqui to photograph the various frogs, snakes & hummingbirds that our local guides will locate for us, then to a rainforest lodge, with stunning panoramic views of the famous Arenal Volcano & Lake Arenal, the lodge is set within 2000 acres of rainforest filled with exotic birds, wild animals & tropical vegetation. On to the San Gerardo De Dota Valley, where we will be seeking out the Resplendent Quetzal, this bird is considered to be the startling emerald jewel of the cloud forest. 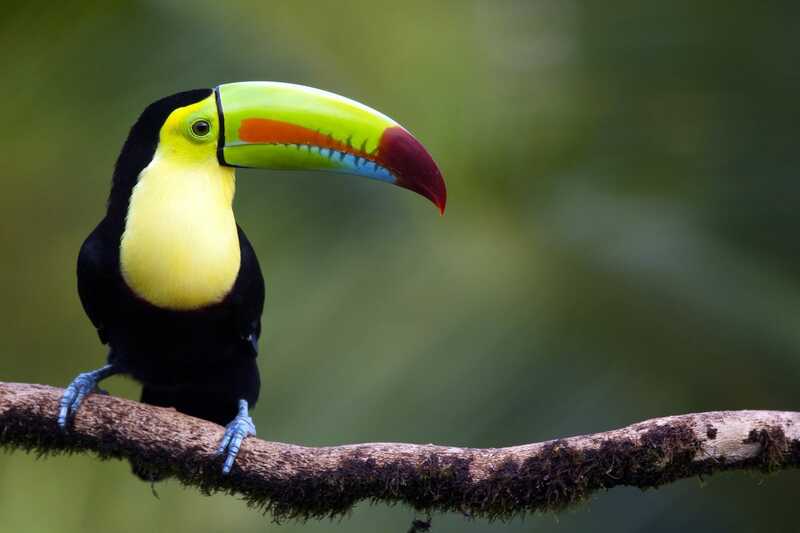 Finally, we head to, Selva Verde, here we can expect to photograph up to 3 species of toucans & other colourful birds of Costa Rica like Tanagers, Motmots and Trogons. The weather can vary between different times of day in this region at this time of year, so we advise that you bring layers & prepare for somewhat unpredictable weather conditions. Join NaturesLens for an amazing trip to photograph the diverse & startling Costa Rican wildlife, this is a wildlife photography experience you will never forget. Places are limited, so book today! Always good trips, with great photographic opportunities, & lots of camaraderie. Recommended! , this photography holiday requires a deposit of, £800 to secure a place. For this photography holiday, we would recommend that you have available, an array of lenses from a macro lens, an intermediate telephoto lens such as the 70-200mm or 100-400mm, through to your longest lens, whether that is a 400mm, 500mm or 600mm. A wide angle would also be useful if you fancy capturing some environment or landscape shots. You should also pack a tripod to help steady your lens, especially when you are out photographing at dawn & dusk. Last but not least, don't forget to pack a flash or lighting unit. For this photography holiday, we recommend that you pack neutral coloured t-shirts teamed with neutral coloured trousers & a hat to protect your head from the sun. January is the best time to visit Costa Rica as it is the dry season with maybe a little rain in the afternoon or evening showers. For this reason, you should also bring a waterproof jacket & waterproof trousers so you are covered for all eventualities. A fleece would also be useful for the cool evenings. Sandals or easy shoes are great for the hotel but you will need sensible shoes for when you are out & about. NaturesLens photography holidays require a minimum number of participants in order to be viable. If this minimum number is not met, the photography holiday may not go ahead. This photography holiday has a minimum participant level of 4 plus NaturesLens guide(s). & takes place in various photographic locations in Costa Rica, between the dates of 16th November - 1st December 2019. It is ideal for photographing collared aracari, glass frog, green macaw, hummingbird, keel-billed toucan, king vulture, red-eyed tree frog, resplendent quetzal, sloth & more. This photography holiday is led by David Miles for NaturesLens. The photography holiday is offered on a Half Board, Non-Shared basis. Group size for this photography holiday is a minimum of 4 participants & a maximum of 5, plus David. We consider this to be an event of Medium level of exertion, if you have any questions about your suitability for this event, please contact us prior to making a booking enquiry. The photography holiday starts & ends at Juan Santamaría International Airport. Transfers between Juan Santamaría International Airport & various photographic locations are included in the cost of this photography holiday, this photography holiday requires a deposit of £800 to secure a place. Deposit required to secure a place: £800 payable upon making a booking. Final balance payment due: August 16th, 2019*. Bookings made after this date will require the full payment to secure a place. Bookings close: September 1st, 2019. Join NaturesLens to capture images of the massive number of bird species & other wildlife of Costa Rica, in various photographic locations, during December 2019, for the Costa Rican Wildlife photography holiday, which is offered on a half board, non-shared basis. Whatever your query regarding our photography holiday, Wildlife of Costa Rica, please fill out your details below & we will get back to you.